While researching for some articles on repurposing and reusing plastics, I ran across an instance of general repurposing that was really commendable. When Oliver Douglas on Green Acres needed a new head gasket for a truck, Mrs. Douglas provided him with something she ordinarily would have thrown in the trash. Namely, the leftover outline of her "hotscakes" as she makes them with a metal lid, like a cookie cutter. I found this reference on an automotive forum, where all the other users also remembered this episode. They also recalled that Fred Ziffel did some more repurposing by using Lisa's extra hotcakes to shingle his roof. at the Gabor's beauty regime but they had to have tremedous genes. It is funny how some of these famous people look better in person than their photos. Once I got to see Ivana Trump close when she signed autographs at Penneys when she opened a skin care line. (She was lucky she got out of Monroeville, because a blizzard hit that evening before she left the store. I was working there part time and remember getting stuck in snow going home.) In magazine photos I never thought she was that attractive, but up close it was very different. She looked gorgeous. I thought the woman looked familiar -- she is Eva Gabor. The male lead is Eddie Albert. I never watched the show but knew about it. 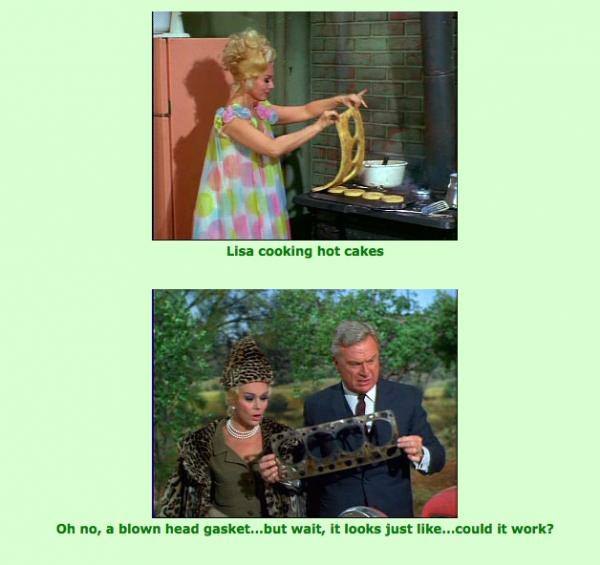 Typical sitcom jokes -- her cooking is bad but has its uses. Next. I remember the title of the show but not the show. Well, except that the female lead had an accent. I thought for many of us it was inescapable. That and Gilligan's Island. That's really funny. Reminds me of a new cinnamon roll recipe I tried yesterday. Did you cut them out with a pot lid?